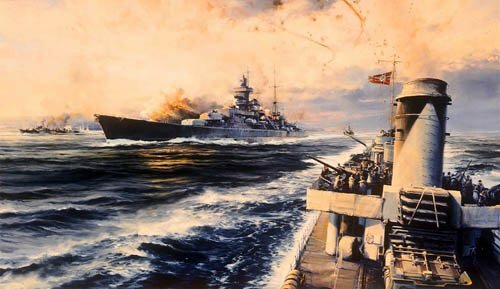 The Prinz Eugen, one of the finest and most famous ships in the German Navy, shelling Russian shore positions in Western Samland, the Baltic, January 1945 Earlier in the war The Prinz Eugen took part in the sinking of H.M.S. Hood and later the Channel Dash. Overall print size: 36" x 24"
TWO of Prinz Eugen's distinguished officers.